University of Sheffield Teacher (lecturer) and former PhD student. 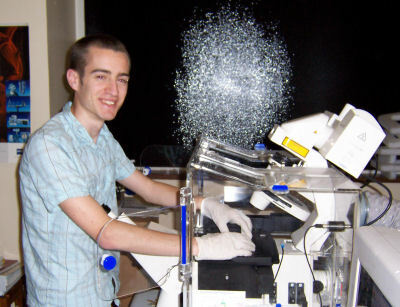 Matt is a University Teacher in the Department of Physics and Astronomy, and before that was an EPSRC Prize Fellowship winner in a collaboration with Dr Allan Pacey in the Department of Human Metabolism. For his doctorate Matt studied the diffusion of polymers on surfaces close to their glass transition. Matt used fluorescence correlation spectroscopy to this end, and is pictured with the kit. FCS is a single molecule technique that works by detecting the fluorescence as laser dye-tagged molecules drift in and out of a confocal volume. The kit we use is a Zeiss LSM510 confocal microscope/confocor 2 FCS combi. Matt is a graduate of the University of Sheffield and had the unusual good sense to want to do a PhD in the area of Soft Matter. I guess doing Physics with Astronomy as a degree allowed him the fullest perspective to made him realise what was and what wasn't interesting. Anyway, well done Matt. You have taste and sense. On Tuesday August 16, 2011 Matt successfully defended his thesis before his examiners, Professors John Torkelson (Northwestern University) and Tony Ryan (University of Sheffield). Matt's EPSRC prize fellowship to study the motion of sperm, as if polymers were not interesting enough. Despite the fellowship only lasting a year, and the many difficulties in wiorking with live cells, Matt was able to publish his work in Theriogenology, a journal of animal reproduction! This is a great achievement. Anyway, Matt is now a University Teacher (lecturer to anyone who speaks English) at the University. It does mean that Matt has not so much time to spend on research as he used to, but he soldiers on.